Our one bedroom + loft villa is surrounded by native bush land with easy access to everything the island has to offer. It is just a short walk to the beach and jetty for those beautiful Queensland sunsets. 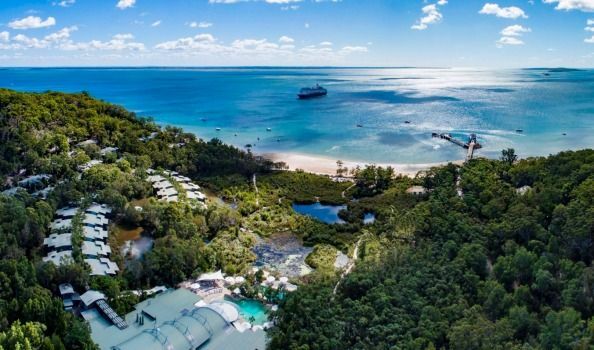 Situated on the World Heritage Listed Fraser Island explore spectacular natural sites and sounds via tours, using your own 4WD or rent one and have your own adventure. The villa is adjacent to the award winning Kingfisher Bay resort so you can access the resorts many restaurants and sports / tours packages and expert rangers who can answer all your questions about the island. The villa is great for couples that want that extra space and privacy that comes with being nestled in the treetops or for families with young adventurers who can navigate to the loft bedroom (The loft bedroom is recommended for children from 8+ years that can safely negotiate a loft staircase). The island is accessible via ferry / barge so you can bring your own or rented vehicle over or simply walk on the ferry. Book as soon as you confirm your trip so you get the time you want. Welcome to Fraser - we hope you enjoy all it has to offer as much as we do. 1) Where is the villa located? Once you arrive at the resort drive to the one and only roundabout and head up the hill. The second road in the right is William Edwardson Lane. Go up William Edwardson and we are the second set of villa's. Go to 535 and get the keys from the lock box. 2) Do I have to clean the villa before I leave? No but we ask guests to strip the sheets, tidy up the unit, leave the dishes washed and empty the garbage. 3) Do we get access to the Resort facilities? Yes - all of them are available to you. Payable services can be charged to your credit card and the great advice from the rangers at the resort reception is excellent (and at no charge!). We are a family of 4 - Zonya, Tom, Jake and Pearl. We bought what we call "Camp Saphire) back in 2004. I happened upon 535 while staying at Kingfsher and that was all it took. We live in Sydney and get there as much as we can. Our little villa is not an investment - it's a life style. This purchase of the villa probably won't appreciate much with time but it is certainly getting more appreciation from us over time. It's cosy, gives access to one of the most wonderful places in the world to explore and provides all the comforts you could desire with a little bit or luxury thrown in. . Spacious bathroom with all the amenities, towels and supplies. Full sized shower and bath. Complete access to all the facilities at the Kingfisher Bay resort - 3 pools - spa - 3 restaurants - guided tours - guest information services - tennis - kids events all await you. From the deck there is a view west towards the Great Sandy Straight. Lovely sunsets are seen through a bush land forest. Rentals are available at the resort. From the parking lot at the top of the hill you can access the villa with a wheel chair. No four wheel driving but a bit on an incline will get you straight into the villa. Kingfisher Bay has 3 pools. All are unique and have their own appeal for young and old alike. Very much as advertised!! Owners were very responsive. We were able to use all the amenities of the hotel which was so great. The villa was nice and tidy and had everything you could need. Would definitely stay here again! Wherever you look you see an interesting feature, from the high ceilings and loft bedroom to the private balcony among the trees, complete with resident kookaburras, who'll steal your toast from in front of you given the chance. Well equipped and functional, great having access to resort facilities. Very helpful owner. Could happily have stayed longer. Very much as advertised. Beds comfortable and all furniture, fittings and equipment of a good standard. Lovely to sit on the balcony for meals and relaxing. Owners very helpful and responsive; a pleasure dealing with them. Would have liked a small gas or electric b-b-q for cooking on the balcony. Lovely villa at Kingfisher Resort on Fraser Island with all the amenities of the resort. Great communication from hosts. Would recommend. There are loads of things to do at Fraser Island. Just have a look at www.visitfrasercoast.com/destinations/fraser-island to see if anything catches your eye. The resort where the villa is located is a great place to relax after a busy day adventuring for information on the resort please see www.kingfisherbay.com/ ..... or alternatively exercise.....exercise your right to do nothing but relax. We hope you enjoy it as much as we do.